In May, I attended Innovate West at Connect Charter School in Calgary, Alberta. Why did I travel all the way to Calgary for an education conference? US policy makers: take note. The educators in Alberta get it. Period. And the Connect Charter School is a great example. Inquiry model, problem-based learning, outdoor education, and an environment where the kids are thriving. Is it a perfect system? No, but I really believe they’re on the right track when it comes to how students learn and how they should be assessed. My favorite day was Friday. The Connect students led tours around their building and explained how they learn. They were so proud to share their school, and every single student, regardless of age, was able to articulate how this school is different and how it works for them. I’ve visited this school for three years now, and the day of the tour is always my favorite. Friday night, I had the pleasure of speaking to the Innovate West audience as one of three keynote speakers. I love sharing the story of my students and our classroom. The things my students come up with in our inquiry-based school always amaze me! It was an incredible opportunity to share the the things they learn, say, think, and do on a daily basis. 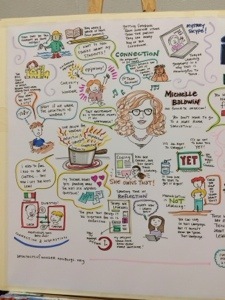 The conference hosts had invited a local Calgary artist, Sam Hester, to create a “sketch note” drawing of the three keynotes. After I finished and walked over to her work, I was immediately overjoyed with what I saw. My students were living on that page! I couldn’t wait to share it with them when I returned to school the next week! With Sam’s permission, I’m sharing the portion of her work where she drew my kids. In my next post, I’ll share the learning that happened for me at Innovate West. I can’t recommend highly enough this conference… and what it’s like to attend a conference outside your “own backyard.” It’s good to see and hear different perspectives and methods of how we should be thinking about teaching and learning.